My name is Jamey Aston. I am a composer with experience and ability in several genres. 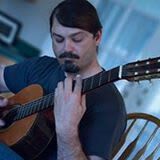 I compose classical, jazz, and contemporary music. I have experience in writing jingles and theme songs, as well as longer works written for the sake of music itself. In addition to composing, I am also a vocalist (tenor). My range is from A an octave below middle C to B flat above middle C, full voice. I sing classical, rock, country, jazz, folk, and other styles. A: Just recently I wrote a piece of background music for a powerpoint for a woman in AZ. Her powerpoint was pretty long and she requested a few revisions to avoid the obvious effect of a looped soundtrack. The end result was the beginnings of a beautiful concerto for oboe and string orchestra. I composed the piece. It's not finished as a standalone piece yet, but the powerpoint was a smashing success. A: I'm currently working on a private album of Americana folk/rock songs for myself. A: Digital. 24 bit and 44.1kHz capture the entire range of the human ear. The gear doesn't create the sounds. The engineer's ears and their skill level create those sounds. It might take a little work, but the sound of analog gear can be recreated within the digital realm, and with non-destructive editing and copying and pasting, it's really a no brainer. A: I will do everything within my power to make sure you're satisfied with the final result. Music is incredibly subjective (thus we have so many styles). I always put my personal tastes behind those of the client. I'm writing or singing music for them, not myself. A: It's music. I love making music, writing music, performing music, all things music. Composing is my favorite because I have an opportunity to be creative. Jingle writing and theme writing is fun because of the challenge of creating a complete musical thought with such a short time constraint. A: I think the most common question is about price. And the answer is always the same, "It depends." A dry vocal track in the middle of my range with easy English lyrics (I'm a native English speaker) is much easier and less time consuming than a difficult Baroque song that takes me from my lowest note to my highest note with intricate melodic passages. The same holds true to composition. The more complex a piece, the more it costs, particularly if I have to mix the piece afterward. It's much easier to mix two guitars than it is to mix a whole garage band with synthesizers. A: That it's easy. It's not easy. It takes work and time and a lot of listening. Also, I've found that as a freelancer often people think that exposure is as important as money. Maybe, but I can't eat an exposure sandwich. A: For compositions I ask them things that allow me to get a feel for their personalities or musical tastes. Do you like rock and roll or jazz? What sounds do you like (for example, I like cello but not violin, guitar but not piano)? What artists do you enjoy listening to? Anything that can give me a sense of what they might want in a piece. For singing, I usually ask them what sort of tone do they want. There's a big difference between open voice classical singing and pop singing and rock and roll belting. The same song with the same instruments and the same words can be completely different depending on the tone that a vocalist uses. A: Know what you want and tell me EXACTLY what that is. In the client/provider situation, I'm making music for you, so your tastes are the most important. The more information you can give me, the better music I can deliver back to you. A: My classical guitar, my cello, a ton of pencils and staff paper, and a tuning fork. A: I've been singing since I was 6. I started songwriting when I was 17. I then joined the Navy for 15 years, got out, went to school for composing and here I am. I've always approached music on a more professional level, although I've just recently started to charge people for my services. A: My songwriting is all over the map, which makes it difficult to build a fan base actually. People never know what I'll write next. My composing is varied as well. I like to combine classical music styles with more modern music in creative ways, like putting a samba section into a Cello/Classical Guitar Sonata for 16 measures. A: Yo Yo Ma. He's amazing. He is such an incredible performer and really puts so much into the music he plays. On top of that, he plays everything. I've heard him play Bach, Astor Piazolla, and even rock and roll. Amazing musician, amazing man. A: Perfection is nice, but being a perfectionist will hurt you more than it will help you. There is a difference between poor quality and subjective taste. You need to be able to identify when you're just wasting time with that 900th guitar take. If the music is never actually heard because it's not perfect, well, you haven't gained anything. A: Both as a composer and a vocalist I find myself doing a wide range of styles. I'm very comfortable in the classical realm in both areas. I also do most of the common radio genres, rock and roll, country, jazz, bluegrass and Broadway, even opera are all styles that I'm very comfortable with. R&B, Hip Hop, and rap are some styles I'm not very familiar with. EDM is also something that I don't do much of. It seems simple enough, but there are subtle differences and subgenres that listeners would pick up on that evade my ears. A: I suppose that musically, my strongest suit is my voice. I've been singing professionally on and off since I was six years old. After that, my sense of musicianship is probably my next strongest skill. I find this skill invaluable in my composing. It's one thing to keep layering more and more sound into a piece and make them all work rhythmically and harmonically. But to know when to stop is equally as important. Does the piece need an orchestra, or will it be more effective with just a cello and a classical guitar. The saying goes, "Less is more." but it's even more important to know when enough is enough. A: I think my greatest offering is that I treat every song as a magnum opus of sorts. I take all of them seriously and deserving of my best work. Whether it's a heartfelt art song based on a 17th century love poem or a silly parody occasional piece, for them to work, they need to be approached seriously and with an artists full dedication. A: For composing each piece calls for its own approach. Sometimes I'll develop a harmonic progression first. For other pieces I'll work with a melody or even just a short theme. At times the rhythm is actually the driving force behind a song. Much of it depends on the needs of the client. After the initial inspiration has come and gone, it's time to put my musical knowledge to work. This is where I apply my knowledge of theory and song craft. For singing, I read through the piece and try to get a feel for the emotional direction of the song. Then I use a lot of imaging to try and really become the character of the song. A: Logic Studio 8 and a Yamaha S90ES. MOTU 24 i/o. Numerous microphones including the ubiquitous Shure SM57. Finale 2014 for scoring work. Thorough broadband acoustic treatment throughout the studio. Martin and Gibson guitars (and a Jose Oribe classical for classical guitar work). A: I'm inspired by both Hans Zimmer and John Williams. I love film scoring. But my musical inspirations are wide spread. I love heavy metal guitars and intricate progressive rock and roll. At the same time I love bluegrass and older country music. I think that the emotional connection to music is the most important thing for me. Music must evoke an emotional response of some sort. It's critical. A: My most common job is probably vocal work, although I do quite a bit of composing of short themes and jingles for podcasts and YouTube channels as well.